We’re About Energy. We’re About Innovation. We’re About Vitality. Since 2001. Western Plains Energy was originally created for one reason: to improve the value of local grain. What began with this simple idea has blossomed into a tremendous economic value to the region, whether it is jobs at the plant, fuel sales for the trucks that bring us grain and deliver our products, or the many vendors that spend the night in our local hotels. In 2000, US grain prices were down due to surplus, and farmers were looking for alternative uses for their grain crops. Brian Baalman, a local farmer, attended a value-added presentation at the Commodity Classic in Florida. There, a presenter talked about how his investment in an ethanol plant had increased his earnings per bushel. Inspired by this idea, Brian brought the concept back home. He shared the vision with Jeff Torluemke, and the two set out to organize a group to build an ethanol plant right here in Northwest Kansas. On July 10, 2001, Western Plains Energy, L.L.C. was formed. We’ve Come a Long Way Since 2001. In the spring of 2003, WPE broke ground, and the plant began operations in January 2004. Since then, the company has become a leader in the ethanol industry and has enjoyed many successes along the way. 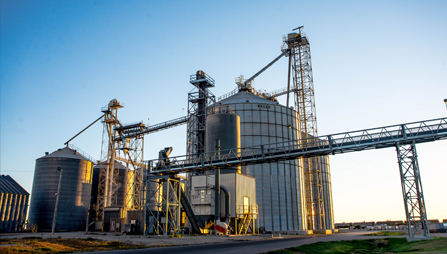 WPE has expanded its fermentation capacity, grain storage capacity, and ethanol storage capacity. Today, WPE currently produces approximately 50,000,000 gallons of denatured ethanol annually. WPE was the first in the industry to trial ICM’s cold-cook process, the first to try ICM’s slurry grinding system, and the first to trial Syngenta’s Enogen corn. WPE is dedicated to continuing their successes by trying new innovations and paving the way as leaders in the ethanol industry. All personal information submitted to this site is kept confidential. No identifiable information is shared or sold. Back To Top follow us! Join Our Distiller's List Now! Join Our Grain List Now!